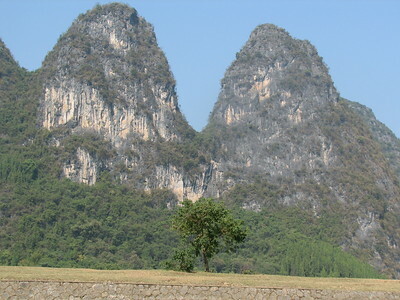 South China Karst can be considered as one of the two great karst regions of the world. Within this 97,125 area spread out over 4 provinces, Shilin is regarded as the world’s best example of stone forests. Guilin Karst is widely acknowledged as having the world’s best expression of a tower karst landscape and has been internationally recognized as the type-site of continental tower karst. During my trip to Yunnan Province in 1994, I visited the Stone Forest (Shilin) that is close to Kunming. Already at that moment in time, before the Chinese tourist boom, Shilin was a popular getaway for many. What I remember is that many of the 'stone trees' had been given inspirational names (like Two Tortoise Stone or Sword Peak Pond), associations more meaning to the Chinese than the western mind. In November 2007, I spent a few days in Yangshuo along the river Li near Guilin. This is a very touristy area, and so much different in atmosphere from the rest of China. 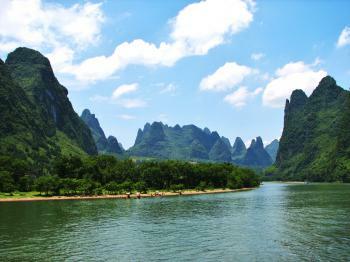 I navigated the Li River in a small boat, the most relaxing way to see this landscape. The next day I biked to Moon Hill, to enjoy some different views of the area. Following my visit to Danxiashan I ventured to Guilin to see the famous Li river section of the South China Karst. Already in Guilin itself you see plenty of rocks rising up and driving to the embarkment of my cruise I noticed even more. The scenery is spectacular and well worth the visit. On my way back to Guilin we also travelled along the mountains, but this time on the other side. And this is where the site's shortcomings become clear. This isn't a huge fenced off National Park, but a scenic stretch along the river. On the other side of the mountains you are back in civilization with cars, highways and plenty of concrete buildings. I visited the Li river (Li Jiang / 漓江) part of the site from Guilin by cruise. Guilin is a less than 3h trip from Guangzhou South. See my comments on the Guangzhou train station in the China Danxia post. The Li river cruises leave only in the morning; there are no noon or afternoon cruises. Which is a pity as you won't get the sunrise or sunset shot of the scenery. It's next to impossible to get to Guilin from Guangzhou in time for the pickup (before 8 a.m.). So I stayed overnight in Guilin with the added benefit that hotels are way cheaper in Guilin than in Guangzhou (140 CNY vs 340 CNY). In Guilin the train station for nearly all bullet trains is North of the town center and you will likely have to get a cab to get to your hotel. Plenty of cabbies will contact you in the arrival hall, but there is also an official taxi stand (follow the signs) with police present. I went for that and paid 25 CNY for my cab to the city center. If you really want to do this as a day trip (and seeing this is part of the Guangzhou Hotspot) there are a few daily bullet trains to Yangshou. The town of Yangshou is part of the inscribed area. It also offers plenty of options to explore the surrounding area. The bullet train station is some 25km away, but cabs are cheap and there are also busses. In any case, disregarding if you travel to Guilin or Yangshou and stay overnight or do a day trip, you need to reserve your train tickets in advance (weeks). For Yangshou all tickets were already sold out when I tried to reserve a few weeks prior. And even with Guilin I did not have my free choice of train. There are two options from Guilin to visit the site: by cruise or by bamboo raft. Originally I had planned to go by bamboo raft, a shorter trip but supposedly a bit more intimate experience than the large cruiser boats. But when my hotel concerige explained to me the rather short itinerary (1.5h by bamboo raft vs 4h by cruise boat) I changed my plans. Looking back I think it was the right call as it was really nice to take in the full river and scenery from start to end. I booked the cruise including English guide for around 350 CNY in my hotel. If I understood it correctly, all cruises are operated by the Guilin Tourist Corporation, the only difference being the category of the cruise ship. I went with a 3 star cruise and it was fine. Disregarding what option you choose the operators will pick you up near your hotel and take you to the embarkment. For the cruise it was a bit more than an hour to get there. At the embarkment you will need your passport as you go through security and checkin. All trips end in Yangshou in the early afternoon. There you have some time to explore the city on your own, i.e. shop for souvernirs. Or you can join yet another tour to explore the surrounding native villages and scenery. Arrangements can be made on the cruise boat and prices are reasonable. In my case in yet another case of underestimating transfer times in China, I urgently needed to get back to Guilin to catch my train at 17:55h. We arrived at 14:00h and I took a ride to the bus from the pier (20 CNY). Not sure if this was the proper bus station. Supposedly, there are half hourly direct express busses to the old Guilin Central Station. The bus I took (30 CNY) stopped along the way and did not go to Guilin central, but to a bus stop on the outskirts of town (1.15h). From there I hopped into a cab (65 CNY) and made it to the station at 16:15h. I don't think you can be much faster and taking the time at the station into account I would recommend to plan at least 3h for the trip. I think Guilin and Yangshou deserve way more time than I awarded them. I would have loved to visit the Longji Rice Terraces and explore the surrounding area and landscape a bit more. The Chinese 20 CNY bill is decorated by a rock formation along the Lii River. It follows that all Chinese aboard our cruise ship pulled out their 20 CNY bills and took selfies with the rock formation as background. Our guides spent plenty of time of telling the story of each rock formation. Still, doing my utmost best I could neither make out serpents, horses nor apples, but the rock formations are nice to look at it nonetheless. Our guides also spent plenty of time selling "local" products such as perfumes and liquors. Unfortunately, they were equipped with a megaphone and spoke English so I had to endure this for a bit. The South China Karst is a wonder to behold. During my time in Guangxi province in 2006 the skies were blue, there was often a pleasant breeze, and the Li River was stunningly picturesque. After Beijing & Xi'an, Guangxi province was a welcome change of climate. The landscape is vivid green, the karst formations are as varied as the names & legends associated with them. The Nine Horse Mural Hill being one of the "highlights" that will be pointed out to you. It is only recently, in 2014, that I learned of the "Phase II" expansion nomination of this unique WHS. Therefore, 8 years after my visit to Guilin, this stunning landscape is now included in the South China Karst WHS. While, I would love to visit other components of this worthy WHS, I am content with visiting the Guilin Karst. Like numerous others, I took the ferry down the Li River from Guilin to Yangshuo. Moreover, I visited several Karst caves in the area. Yet, it escapes me which ones are included in the nominated property. Back in 2006, there were very few foreign tourists, yet Guilin is very famous within China. In the last decade however, there is a growing awareness of this site outside the country. Indeed, there will be plenty of tourists, you only have to look at the back of 20 RMB bill to confirm this particular karst landscapes iconic status. 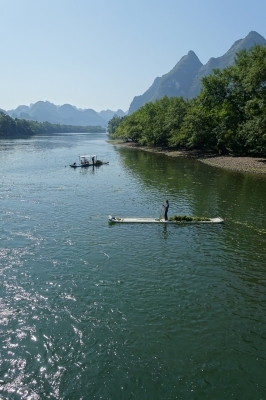 The Li River has inspired artists and poets for centuries. I highly recommend Guangxi Province, it is a beautiful part of China. Lingqu Canal is not far from Guilin as well, so there are plenty of natural and cultural elements to explore. I travelled to stone forest near Kunming in 1985 while backpacking through China with a friend. We found every street corner, every town, every moment to be fascinating. At that time there were few other travellers and we explored the forest by ourselves. I still have a colourful embroidered bag that I bought from a gracious woman. It reminds me of China, a mysterious, beautiful country and my amazing memories. I hope to return one day! Yunnan, the land of Southern Cloud well known for its beautiful natural wonders and unique local culture of many tribes, was chosen by my Chinese Language Club for this year field trip. After wonderful experience from my last year Shanxi trip, I decided to join this program immediately and back to China again. From all natural wonders of Yunnan, Shilin or Stone Forest, a part of South China Karst, seemed to be the most famous tourist attraction, located not far from Kunming, the capital and gateway of Yunnan, by superhighway in just 1.30 hours. Shilin was a fantasy land of complex bizarre gigantic stones in the beautiful well designed stylish park. With the hefty entrance fee of 175 Yuan, as of 2010, Shilin was still full with Chinese tourists who came to see their "national scenic area". I was quite surprised to discover that Shilin was located next to the modern city of the same name and had asphalt road rounded Shilin to serve tourists for utmost convenient. However, the paths inside Shilin were really confusing and small, under the shadow of the rocks; all turns showed the different angle of labyrinthine strange stones and pretty ponds. The center point of Shilin was the small Chinese pavilion built on the top of one rock for view grazing; the view was quite nice and made me understand where the idea of stone decoration in Chinese garden came from. Even though this was not my first time to see karsts or stone forest, I was really impressed with Shilin especially its size and the way Chinese turned this place into the beautiful garden. While in my feeling toward Shilin as a natural WHS was quite reluctant since I hardly thought this place was a Mother Nature creation, but as a big man made Chinese garden that fittingly in cultural site category making Shilin to be one of the most complicated place I had seen and felt. I was born in Kunming,so the Stone Forest is always our pride,each time my friends coming from other provinces or other countries ,i will show them the area. Last year,I have been in England for almost one year,so i can look at the Stone Forest at different angle. nowaways,i know very clear that we have to protect our world very carefully. With the inscription of “S China Karst” in 2007 the WHS list contained at least 12 (??) 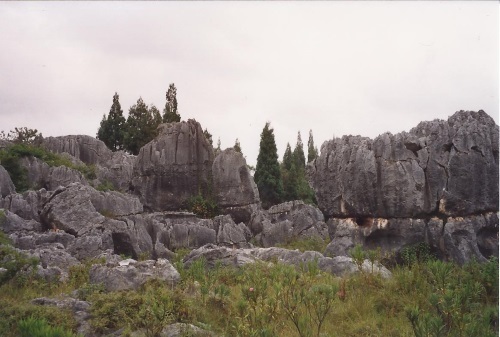 examples of Karst scenery (eroded limestone/dolorite). Since around 12% of continental land worldwide is Karst that might not be so surprising, especially as such landscapes can be extremely interesting and attractive. Enormous areas of Southern China are Karst and, in my mind at least, such scenery is also very “Chinese” in atmosphere because of its use in Chinese painting and garden design. 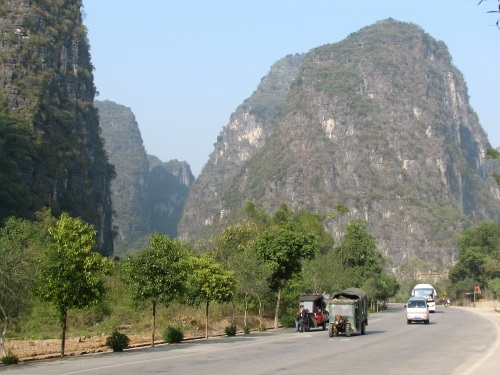 So perhaps it is not unreasonable for yet another Karst site to be inscribed - but which of the many possible examples should China have chosen? Surprisingly, it hasn’t selected the most famous and, in my view the best, example – the scenery around Guilin/Yangshuo, but decided to go with a “serial” proposal of widely spread locations in Yunnan, Guizhou and around Chongqing as a “Phase 1” with Yangshuo and many others to follow in future phases. Coincidentally (???) another site inscribed on the same day at Christchurch in 2007, the Atsinanana Forest in Madagascar, adopted exactly the same approach of serial, physically unconnected sites in what is intended to be a multi phase inscription linked by an overarching “theme”. Has there been some policy guidance from above or have countries seen that this gives them several “bites at the cherry” in getting at least one site inscribed? Indeed the evaluation of both proposals followed a similar trajectory with a few areas being jettisoned along the way as a “sacrifice” on the altar of “Universal Value” in order that the rest could slip through! In the case of S China Karst the areas around Chongqing were removed. If it had failed completely, then the “jewel in the crown” of Yangshuo, separately identified on China’s T list, could still of course have been wheeled in later! Our view of the Karst scenery around Guizhou has been limited to that visible from a train window from Guiyang to Guilin. This was still quite fine but not that close to the inscribed area which is further east in the province. Luckily we have also visited one of the sites chosen in Yunnan – the so called “Stone Forest”. We visited as long ago as 1989 (just 2 months after Tien An Men). It is situated a few hours bus ride from the provincial capital Kunming and is set in an area inhabited by the Yi tribes-people who were well in evidence, dressed in national costume and selling their handicrafts. Even in those days the site was a very busy “Chinese tourist attraction”. Anyone who has been to such attractions will appreciate what this means – the place will be heaving with people, all legitimately having a “good time” with no problems, but in that very Chinese noisy/shoving sort of way! The passage of 18 years, which have transformed the Chinese economy and many of its people’s access to travel and leisure, can only have increased the numbers, let alone an increase in foreign visitors who were totally absent when we were there. When agreeing this inscription, UNESCO/IUCN were conscious of the variety of types of Karst scenery which exist and, quite reasonably, hoped that China can extend this inscription to include all of the major ones and their stages of development, above and below ground, so perhaps Yangshuo will get inscribed via that route now. “Stone Forests” constitute a specific type and are in fact already represented on the WHS list in Madagascar and Malaysia. We haven’t seen these for comparison but did find the formations of the Chinese example (photo) quite remarkable and well worth the side trip from Kunming. The photo shows some of the paths and steps laid out among the pinnacles – there are also bridges, railings and steps cut into the rock. The push of people trying to reach the highest vantage points, often quite precipitously located, can be considerable and, to anyone suffering from vertigo, probably somewhat frightening! Star Wars: The limestone karst mountains around Guilin were depicted as Kashyyyk, the Wookie planet shown in “Revenge Of The Sith.” It was the first time that a “Star Wars” movie had been filmed in Asia. Guangzhou hotspot: Guilin - just 2.5 hours from Guangzhou (but worth more than a day trip). Extended from original TWHS: Originally Lunan Stone Forest Scenic Zone. A serial proposal followed a rejection of the original nomination in 1992.